Student loan debt is increasingly becoming a contributor to stress, burnout, and even suicide in doctors and other high-income professionals. Refinancing private student loans is a no-brainer anytime you can lower your interest rate, even as an intern. 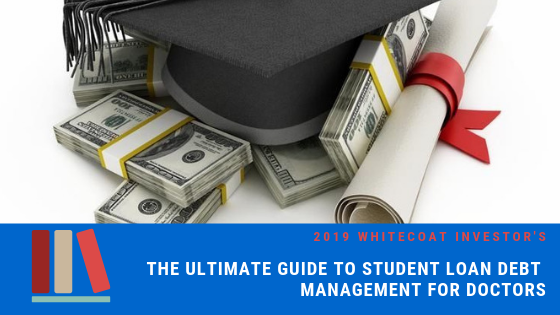 Direct federal student loans can be refinanced as soon as you know you will not be trying to qualify for Public Service Loan Forgiveness and can get a lower rate than the effective rate after the REPAYE subsidy is applied. Refinance your student loans early and often. If you go through the links on this page, you will get a cash bonus. As you pay down your loans, your credit score and debt to income ratio will improve, possibly lowering your rate. Of course, sometimes interest rates just drop or you discover another company is offering a lower rate than your current lender. When I graduated in 2003, most of the members of my class refinanced their loans at 1-2% per year. That became impossible during the Global Financial Crisis and for years afterward. When I started this blog in 2011, you couldn’t refinance your student loans at all. In 2013, companies started refinancing again and now there are a dozen or more doing so. The competition between student loan refinancing companies has helped lower rates and increase cash bonuses. Thanks to the number of WCI readers refinancing large student loans, I have been able to negotiate the best deals available on the internet with these lenders, including cash back bonuses ranging from $250 to $2000 if you use the links on this page. Yes, I get paid too, but this is truly a win-win-win-win for you, me, the lender, and even the taxpayer. Low rates, cash back, better service…what’s not to like? Join thousands of WCI readers who have refinanced their loans through these links and put themselves on the path to financial success. 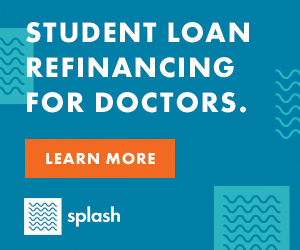 Splash Financial is a leader in student loan refinancing for doctors. Hundreds of you check your rate with Splash each month and it only takes minutes to do so! No application or origination fees and no prepayment penalties. Splash loans are funded by banks and credit unions, who they’ve negotiated with on your behalf to ensure market leading rates. Splash’s technology allows you to see your new rate in minutes without providing your social security number or impacting your credit score. 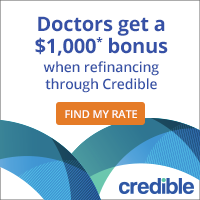 Special offer for WCI readers only if you use our link: Refinance over $50,000 and receive an extra $500 cash bonus. Available for first time customers only. 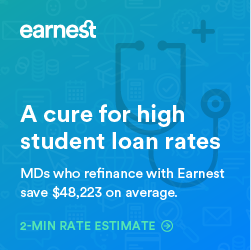 Save money on your student loans by refinancing with Earnest. Choose custom terms to fit your budget – like picking your exact monthly payment or selecting fixed and variable rates. Earnest’s Precision Pricing matches your custom term with a custom interest rate — saving you even more money when refinancing. You won’t be passed off to a third-party servicer nor penalized for making payments early. Your family is always protected with loan forgiveness in cases of death and dismemberment. Get $500 when you sign a loan with Earnest using links on this page. At LendKey all loans are funded by community lenders, like credit unions and community banks. You can consolidate and refinance federal and private student loans, including undergraduate and graduate school debt for 5, 7, 10, 15, and 20 year terms. Recently, they upgraded their experience and now have even lower rates and more options (over 300) for lenders who will refinance your loans. You can compare hundreds of lenders in 2 minutes with no impact on your credit score, and your information isn’t shared with any lender until you select a loan product. Lastly, there are no handoffs, ever. LendKey originates and services all loans on behalf of their lenders so you get to work with the same customer care team from application all the way until you pay your loan back. Simple, consistent, and transparent. 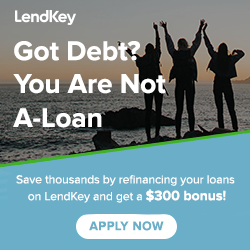 As a WCI reader, if you use the links on this page, you get an extra $300 when you refinance with LendKey for loans up to $150k and $750 for loans over 150K. Laurel Road (formerly DRB) is another huge player in this market and is a long time advertiser with The White Coat Investor. Hundreds of WCI readers have refinanced with them, often reporting they offered the lowest rate of all companies. If you apply via the links on this page and close a loan, you’ll get paid $300. They also have a resident refinancing program with $100 per month payments during residency. Laurel Road has a very flexible total allowable residency/fellowship period, allowing for residency periods up to 8 years depending on specialty – may allow for longer if the loan repayment term is 15 years or shorter. Laurel Road is a brand of KeyBank National Association. All loans are provided by KeyBank. 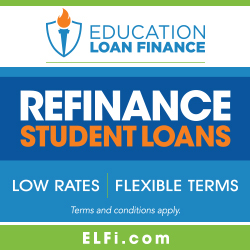 ELFI (Education Loan Finance from Southeast Bank) — Education Loan Finance has come highly recommended from readers for low rates. 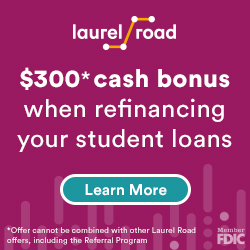 Education Loan Finance offers student loan refinancing and consolidation to both recent graduates as well as parents with Parent PLUS and private student loans. Education Loan Finance offers low rates even without the automatic payment discount that many lenders offer. Loan amounts start at $15,000 and up for qualified borrowers. Education Loan Finance offers repayment terms of 5, 7, 10, 15, and 20 years. These wide range of options provide borrowers with the flexibility they need to choose the optimal product to fit their budgets. Those with high income may opt for a shorter repayment term, saving them money over time. Those who want lower monthly payments, on the other hand, can choose a product with lower rates than they are currently paying. For parents, ELFI offers repayment terms of 5, 7, and 10 years. Education Loan Finance also offers Personal Loan Advisors who are dedicated to each borrower providing individual assistance throughout the refinancing process. Hundreds of WCI readers have refinanced with SoFi over the years. If you apply via the links on this page, not only will I get paid if you close a loan, but you’ll get paid too- $300. If you’re smart, you’ll just have them apply that to your loan balance, but I suppose you could use it to buy a frosty at Wendy’s every day for 10 months too if you want. SoFi is now lending to medical and dental residents with $100 monthly payments. Disclaimer. 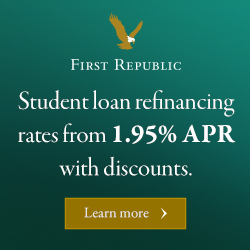 Reviewed here, First Republic offers the lowest rates I’ve seen yet, with fixed rates starting at 1.95% (as of February 2019.) Unfortunately, they only lend to folks who live near their branches- in California, New York City, Boston, Greenwich CT, Portland OR, and Palm Beach FL. But if you live in those areas, take advantage! There is a liquidity requirement of 10% of the amount of the loan. As a WCI reader, if you use the links on this page, you get an extra $200 when you refinance with First Republic. Start your Brazos refinance application through this page and you will get a $400 cash bonus after your loan funds! Texas residents only. 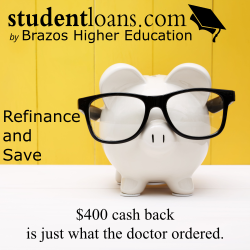 Brazos is a nonprofit with over 35 years of experience with student loans. As a nonprofit, Brazos’ rates can be better than the national lenders. You can refinance up to $150,000 with a bachelor’s degree and up to $250,000 with a graduate, law, medical or other professional degree. If you’re a Texan, visit studentloans.com now and start saving. Disclaimer. CommonBond is proud to partner with WCI to help you save more than $50,000, on average, on your medical school loans. Refinancing with CommonBond will simplify your loans and could lower your monthly payments, helping you achieve your life goals faster. Applying is straightforward and getting an initial rate estimate only takes a few minutes. You can even temporarily postpone payments if you run into financial difficulties. CommonBond is also the only lender to have a “1-for-1” social model—for each loan they fund, they help fund the education of a child in need. Your loan will truly make a difference. Use the link on this page to start your application today. 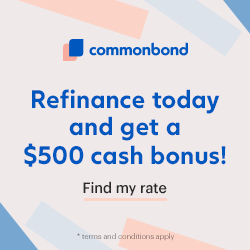 As a WCI reader, you get an extra $500 in your pocket when you refinance with CommonBond. What’s New With Student Loan Refinancing Companies? How Fast Can You Get Out of Debt? Pay Off Debt or Invest?